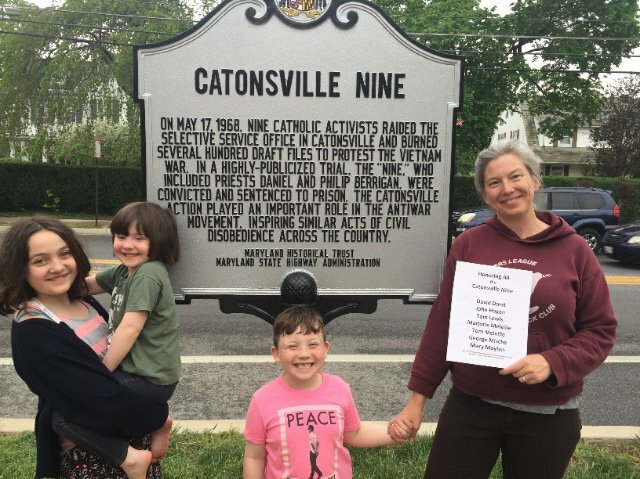 Frida Berrigan stands in front of the newly unveiled Catonsville Nine historical marker in Catonsville, Maryland with her children. Credit: Waging Nonviolence. All rights reserved. It was a big moment. More than a hundred people watched as a college professor held one end of a heavy vinyl cover, helping an 88-year-old woman, pull it from the top of a tall metal sign. Together, they unveiled a familiar looking historic marker—the kind that draws attention to battlefields drenched in centuries-old blood and the birth places of famous men all over the country. This one, however, was different. It read: “On May 17, 1968, nine Catholic activists raided the selective service office in Catonsville and burned hundreds of draft files to protest the Vietnam war.” It now stands on Frederick Road in Catonsville, Maryland—about a block from the building that housed the young men’s draft files. The Melvilles brought John Hogan—a former Maryknoll brother who they had served with in Guatemala—into the action. Mary Moylan, another one of the nine, had been a nurse in Uganda, while George Mische had worked in the Dominican Republic. They all said that part of their radicalization, part of the journey that led them to Catonsville, was a result of seeing the far-flung damage wrought by U.S. foreign policy. David Darst, a Christian brother, and Tom Lewis, an artist and recidivist, had both lived in the inner cities and saw a less exotic version of the same brutal dynamic. The hallmark of so much of our political expression is reactive outrage. It was then too. “Hell no, we won’t go,” was a slogan to be chanted by the young men who were drafted. There is so much to be outraged about, and our outrage matters. But the members of the Catonsville Nine were not outraged. And their action was not a response to the massacre du jour, but to the whole of U.S. foreign policy. As John Hogan said at the trial, “I just want people to live. That is all.” And it was not carried out by those most affected by the draft. In fact, every member of the action was personally exempt from military service by their age, gender or profession, as priests and brothers. It was nine people stepping out of comfort and into commission and conscience. My father would accept their thanks with discomfort and pride. Now, from a greater distance, I can understand the discomfort as part of a veteran’s process of atonement, a life saved from war after so many lives lost in war, and an affirmation of the path—narrow, rocky, grueling and lonely—that he had chosen for himself. And then there were the friends, fellow community members—people as close as family. One was a young mother on Long Island, raising five boys. On May 17, 1968, she was sitting in her kitchen, listening to the radio, busy with some household task. The news announcer reported that nine Catholic antiwar activists were arrested after destroying draft records. She was a devoted Catholic, and this was an action involving two priests, a brother, a former priest, a former nun and four lay people. “I was sitting down, and I stood up. I haven’t sat down since,” she said. She went on to be a Catholic Worker, peace activist and a dear friend. I have heard that story countless times, from her and many others who were similarly catalyzed into activism by the Catonsville Nine. Learning about this one day in May through the prism of the transformations of both strangers and friends has helped me see the draft board raid as living and continuing. It may have been 50 years ago that my father was one of nine who broke the law to prevent a greater crime, but it was only a month and a half ago that my mother, Liz McAlister, was one of seven, acting in that same spirit. As a member of the Kings Bay Plowshares, she gained access to the Kings Bay Trident Base in Georgia and symbolically disarmed the warheads, marking them as criminal. For this action, they face more than 20 years in prison. It seems like a very long time. Action, community, collective courage—that’s the spirit of the Catonsville action. It is a way of survival. It tells us our souls are our own. So, thank you, Brother David Darst, John Hogan, Thomas Melville, Marjorie Melville, George Mische, Tom Lewis, Mary Moylan. Thank you Uncle Dan. Thank you Dad. And thank you, Kings Bay activists, friends, family: Martha Hennessy, Clare Grady, Father Steve Kelly, Patrick O’Neil, Mark Colville, Carmen Trotta. Thank you Mom.